Dr. Edith Terwey was working at a private veterinary practice in Minnesota before moving to Hawaii a few years ago. Now with the state Livestock Disease Control Branch, she screens livestock coming into the state for diseases. 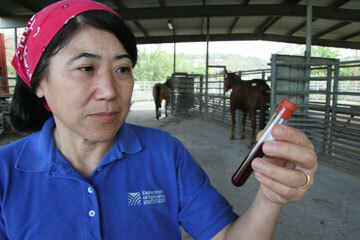 Above, Terwey holds a blood sample from a horse. Job: Seeks to prevent the spread of animal diseases among livestock in Hawaii. Edith Terwey is like most people who become veterinarians: She likes animals. The veterinary medical officer for the state Livestock Disease Control Branch, based in Halawa Valley, says she even sometimes finds herself talking to the various creatures she has to screen for diseases -- though she realizes they are unlikely to talk back. Terwey joined the state branch in 2003 after moving here from Minnesota, where she had worked in a private veterinary practice. She initially had come here on vacation, she said, and "I just decided I would really like to try living here." She enjoys her new job, "And, no," she added with laugh, "I do not miss the snow (in Minnesota). Everybody asks me about that." Terwey, 51, is a graduate of Columbia Heights High School in Columbia Heights, Minn., and did both her undergraduate and post-graduate studies in veterinary medicine at the University of Minnesota. Her first job out of college was with a dairy practice in Wisconsin. She has two adult children -- a son and a daughter -- with her husband Roger, with whom she lives in Waipahu. Question: What is your overall responsibility as a veterinary medical officer for the state? Answer: Well, I have a very long job description, but to boil it down to a very short job description, it's basically to prevent disease from entering the state and to control the diseases that are here. It's not just any diseases; it's specific diseases that the state has given us authority to regulate. The way it works when any government works to regulate a disease is that it's usually a disease that transmits to humans, or a disease that causes severe economic losses to the farmers. And I don't deal with all animals. It's just livestock in general. So I don't work with the cats and the dogs and pet birds. It's just the cattle, horses, sheep, goats, and domestic pigs. Q: Are you the only one? A: There's two veterinarians on the Big Island, Dr. Jason Moniz, and Dr. William Bergin. And I guess we're looking for another veterinarian. A: I think they'd like to staff Maui. There was a vet on Maui, but he just left. Q: Why does the Big Island have two? A: Because it's so large, and it's a little too much for one veterinarian. Q: Does the Big Island have more animal industry? A: It has a large number of ranches over there. Most of the beef cattle in Hawaii are on the Big Island. Q: What kind of staff do you have? A: Well, counting the office staff -- and they're not really my staff (Laughter) -- we have two people in the office here, and we have a livestock inspector and an animal caretaker. Q: What kind of a lab or research facilities do you have? A: Well, the Hawaii state veterinary lab is located in our building. But they're a different branch. We're livestock disease control, and they're the veterinary lab. The state has several veterinary medical officers. 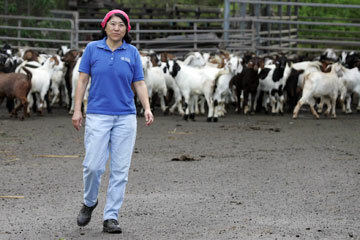 On Oahu, the position is held by Dr. Edith Terwey, who works with animals such as cattle, horses, sheep, goats and pigs. Above, Terwey last week visited with a herd of Boer crossbred goats at the Livestock Disease Control Branch facilities in Halawa Valley. Q: What kind of diseases are you looking for? A: Like I said, we're looking for specific regulatory diseases, For instance, with the horses that are coming in, were looking for equine infectious anemia, which is an incurable viral disease in horses. And then, of course, we always are looking out for rabies. Q: There can be rabies in these larger animals? A: Any animal can get rabies. It's not as common in livestock as in dogs or other predators, but it is seen in horses every year on the mainland. Any warm-blooded animal can get rabies. Then with the pigs, the animal that causes the most disease problems in the state is actually the wild pigs, because even though the state of Hawaii is classified as free from brucellosis and psuedorabies, these diseases are known to be continuing in the wild pigs, and we have problems when the feral pigs mix with the domestic pigs and then infect them. So I do the disease surveillance on Oahu. What we do is we sample the domestic herds and check them for those diseases. Q: You go to the farms? A: Right. We do a statistical sampling of 25 percent of the swine herds every year. Q: Are there many commercial swine herds on Oahu? A: Yeah, actually there are quite a few of them around. Unfortunately, it's like the rest of agriculture: smaller numbers every year. Q: Where are they mostly concentrated? A: There's a lot of them in Waianae, and there's some in Waimanalo, and there's a few scattered around everywhere else. There's actually some in Pearl City, believe it or not, and there's some in Kaneohe. Q: Can people get sick from eating the feral pigs? A: People can't catch psuedorabies, but other animals, like dogs, can get psuedorabies, and people can get brucellosis. Every year, some people get that. They get that from hunting feral pigs. You can get that from any of the fluids, so if you're hunting pigs, it's important to wear gloves, like if you're butchering the pigs. Besides horses and pigs, there's also a control program for sheep, which can get scrapie. That's a central nervous system disease of sheep, similar to mad cow disease in cattle. It's called scrapie because its a neurological disorder, and the sheep start itching themselves a lot. But there's a control program for that. And for cattle, we monitor for brucellosis, tuberculosis and anaplasmosis. Then also bovine spongiform encephalopathy -- mad cow disease. Q: Besides rabies, why would you worry about diseases in horses? A: Equinie infectious anemia is such a serious disease for horses, although in the future, Hawaii might be less severe about the disease because the incidence is decreasing on the mainland. But we're still the only state that has never had it. Q: Do we have a big horse industry in Hawaii? A: There are a fair number of horses around here. People play polo, and there are a lot of recreational riders. They (horses) are the species that moves around the most between here and the mainland, that come here the most that we inspect. Q: Do any of these diseases ever slip through? A: We don't believe they have. Tuberculosis crops up occasionally on Molokai, but again we think part of the problem there is the feral pigs, which act as a reservoir for the disease. Q: Most cattle would be going out of the state, wouldn't they? A: Yeah, mostly from the Big Island. They ship a lot of cattle to the mainland, and very few actually come to Hawaii. Q: Who inspects those outgoing cattle? A: They have to meet the import requirements of the states they're going to. But most of those states, they're not like Hawaii; it's much easier to import livestock into those states without going through state inspectors, so most of the cattle in Hawaii are inspected by private veterinarians. That's so the people getting them on the other side know they have been inspected. Q: So I guess you like animals, huh? A: Yeah. I think all vets like animals, that's why we get into it. Q: Do you ever anthropomorphize the animals you deal with? A: (Laughter) We do it all the time. Q: Do you feel their pain? A: (Laughter) Yeah, I guess we do. We try to be nice to them. You find yourselves saying things to them like, "If you would just hold still, we could have been done by now." (Laughter) But they never talk back. Q: What's your favorite kind of animals? A: They all have their own unique charm. You just have to appreciate it. Because there are things you can do with horses that you can't do with cattle, and vice versa. So you just have to appreciate the way they are. Q: Do you ever have to order the death of any of the animals that are imported, or do you just send them back to where they came from? A: Well, I suppose one of these days I'll have to do that (put an animal to death), but I haven't had to do that yet. We've had some sick ones that had to be treated, but we didn't have to put them down. A: Well, there's a lot of variety; you're doing something different all the time. You also get to work with animals -- and the people who own them. A lot of the time, people who own animals are very nice people, very practical, very salt-of-the earth kinds of people. Q: What kind of medical training did you have to have to get this job? A: You have to go to a veterinary college. Your undergraduate plus four years of vet school. Q: How do you stay current with the latest developments in veterinary medicine? A: Well, you attend continuing education classes. A: The Hawaii Veterinary Medical Association has them every year. Q: Are you qualified to work as a doctor on humans? A: No. (Laughter) I can work on myself. That's about it.